Find your dream job at UCC! At any given time we have a number of full and part-time positions available in a variety of career fields. Please explore your professional possibilities here at UCC. 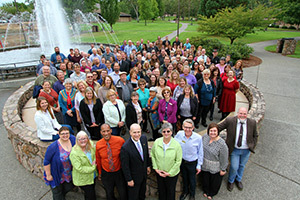 Umpqua Community College is an equal opportunity employer that offers its full-time and part-time employees a full array of benefits. Many employees enjoy the ability to choose from health, dental, vision, life and long-term care insurance plans. All employees benefit from working on one of the most picturesque campuses in Oregon that offers a wide range of educational and fulfilling programs and facilities. Perhaps most alluring to many is our working atmosphere that presents challenges, rewards and intellectual stimulation. The UCC campus is host to a full variety of theatrical and musical performances that all employees can attend and enjoy. Working here affords you the opportunity to contribute to the community and help individuals reach their educational and career goals. In turn, the world becomes a better place and is enriched. We are looking for individuals that see challenges as opportunities to grow professionally. If you are a team player that likes to contribute to the overall mission of the team, please consider working with us at UCC!